I made a visit today to Madison's newest distillery, Spirits of Madison. 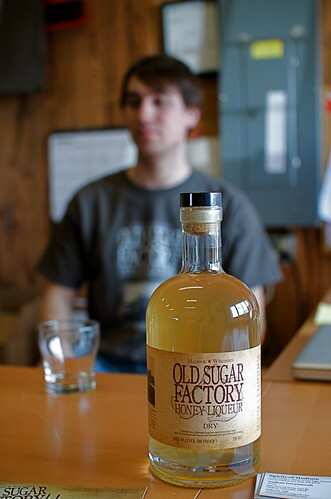 Their only product at this moment is "Old Sugar Factory Honey Liqueur", a tasty rum-like liqueur made with, well, honey. It is not rum, because rum must be made with cane sugar, and they are using Midwestern grown dark brown beet sugar. It is the sort of sugar that was pumped out by the United States Sugar Company from 1906 until the factory was purchased by Garver Feed Mills in 1929 (and which will hopefully house the Madison Arts Incubator in the near future!). 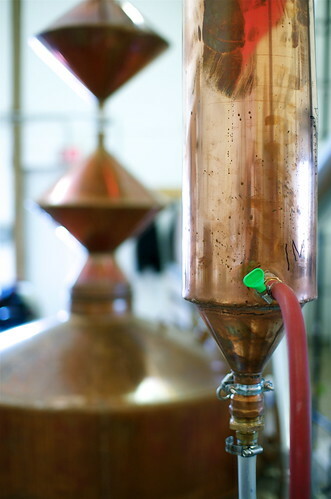 At the heart of the operation is the still itself, a delightful copper device made by a bloke in Arkansas. Suitable for liqueurs, it is too short to be used for stronger spirits such as gin or vodka. Once boiled, the steam ascends through the cooling upper chambers, which also contain pieces of copper that act as further cooling fins, and moves through a pipe into a smaller chamber which is really a water-jacketed series of pipes that return the steam to liquid for collection. The first gallon or so are discarded as they contain impure alcohols. Once flowing good product, it is stored in as stainless tank that looked to be about the size of a half-barrel of beer, or maybe a bit larger. 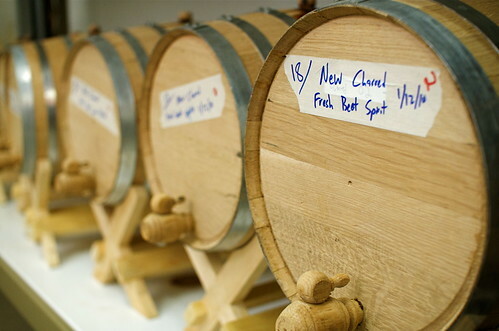 From there, the liqueur is transferred to oak barrels for aging. 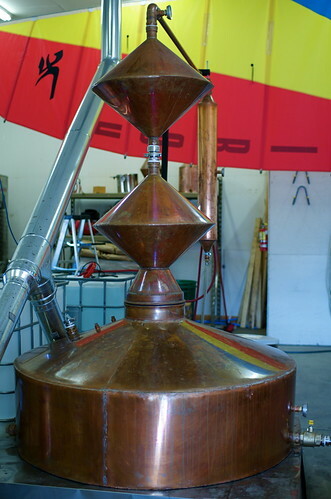 Spirits of Madison uses small barrels so that there is a lot of barrel per unit of liqueur which speeds the aging process. The first product is in some local stores (Woodman's and Star) and sells for $30. I had a sample of it, and enjoyed it enough to buy a bottle. There are a few more photos of the works, plus these, in a larger format SLIDE SHOW.